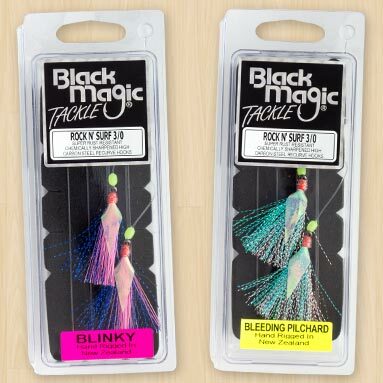 Two colours to choose from; the tried and tested “bleeding pilchard” with its red/blue/silver combo, and the “blinky” with its hot pink/blue combo. Each fly is topped with a soft, long-life lumo bead which is great for fishing at night, or in deeper water giving your hook that added attraction. ​These rigs are ideal for a range of species including snapper, salmon (kahawai), flathead and tarakihi. Developed for use from the rocks, beach or wharves, they are also effective fishing “straight up and down” from boats. Just put a small strip of bait on each hook, attach a suitable weight, and you’re ready to cast. IGFA legal for tournament use or record claims. 3/0 suicide hooks rigged on 60lb Tough Trace. 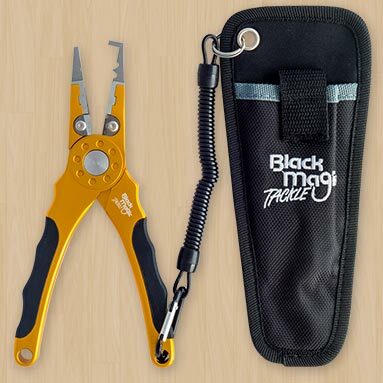 Black Magic flasher rigs are assembled and packaged in New Zealand, incorporating the best components, ensuring a quality product so you get the best results. Cuts braid and heavy mono cleanly. Not suitable for hook removal or cutting wire.